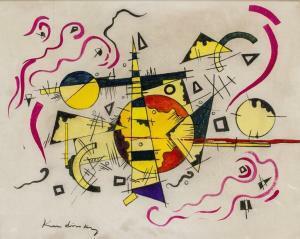 Find artworks, auction results, sale prices and pictures of Wassily Kandinsky at auctions worldwide. WASSILY KANDINSKY Holzschnitt für die Ganymed-Mappe. 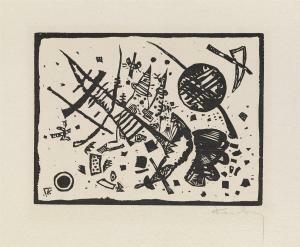 Woodcut, 1924. 150x200 mm; 6x8 inches, full margins. Edition of 100. Signed in pencil, lower right. Published by R. Piper & Co., Marées-Gesellschaft, Munich. From Der Dritten Ganymed-Mappe. A superb, evenly-printed impression of this very scarce woodcut. Roethel 181. Wassily Kandinsky (1866-1944) Ohne Titel signed with the monogram and dated '38' (lower left) pen and ink on paper 12 1/2 x 10 5/8 in. (32 x 26.9 cm.) 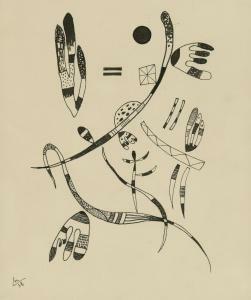 Drawn in 1938 Provenance Nina Kandinsky, Paris, by descent from the artist. Karl Ströher, Darmstadt, by whom acquired from the above in 1956, and thence by descent to the late owner. Wassily Kandinsky Russian Abstract Oil on Canvas Oil on canvas, stretched and framed. Featuring an abstract suprematist composition. Signed Kadinsky on the lower left corner. Attributed to Wassily Kaindinsky (Russian, 1866-1944). 39 x 49 cm (15.4 x 19.3 inches). PROVENANCE: Southern Ontario estate Wassily Kandinsky (1866-1944) was a Russian artist whose vibrant abstract paintings paved the way for Non-Objective Art. In an effort to step outside pictorial tradition, Kandinsky often described color as sound, with several of his most famous works titled using musical terminology, including Improvisation 28 (1912) and Composition VII (1913). \“Color directly influences the soul. Color is the keyboard, the eyes are the hammers, the soul is the piano with many strings,\” he wrote in his book Concerning the Spiritual in Art (1911). Born on December 4, 1866 in Moscow, Russia, as a child he studied music and drawing but chose a career in law as a young man. It was not until 1896 at the age of 30, that Kandinsky moved to Munich to pursue an education in painting. While in school, he forged relationships with Franz Marc, August Macke, Alexej von Jawlensky, and Gabriele Münter. Together, these artists formed the short-lived Der Blaue Reiter group. Due to the outbreak of World War I, Kandinsky returned to Moscow, where he spearheaded Russia\’s embrasure of avant-garde aesthetics, holding posts at both the University of Moscow and the Institute of Artistic Culture. After returning to Germany in 1921, Kandinsky began teaching at Walter Gropius\’s newly formed Bauhaus School in Weimar. The school was shuttered by the Nazi regime in 1933, and the artist was once again forced to flee Germany. He died on December 13, 1944 in Neuilly-sur-Seine, France. Today, Kandinsky\’s works are held in the collections of the Art Institute of Chicago, The Museum of Modern Art in New York, the Tate Gallery in London, the Centre Georges Pompidou in Paris, and the Albertina in Vienna, among others. Wassily Kandinsky VERTIEFTE REGUNG (DEEPENED IMPULSE) 1866 - 1944 signed with the monogram (lower left); titled, dated 1928, inscribed with the measurements and numbered 424 on the reverse oil on canvas 100 by 76cm. 39 3/8 by 29 7/8 in. Painted in February 1928. Otto Ralfs, Braunschweig (acquired from the artist) Salomón Hale, Mexico City (acquired from the above in December 1931) Private Collection (acquired from the above) Private Collection, New York (by descent from the above. Sold: Sotheby's, New York, 5th May 2010, lot 20) Private Collection, USA(purchased at the above sale. Sold: Sotheby\’s, New York, 5th November 2015, lot 23) Purchased at the above sale by the present owner Exhibited Düsseldorf, Deutsche Kunstausstellung, 1928, no. 477 Literature The Artist's Handlist IV, no. 424 Will Grohmann, Wassily Kandinsky, Life and Work, London, 1959, no. 424, catalogued p. 337; fig. 284, illustrated p. 373 Hans K. Roethel & Jean K. Benjamin, Kandinsky, Catalogue Raisonné of the Oil Paintings, London, 1984, vol. II,no. 867, illustrated p. 801 Klee & Kandinsky: Neighbors, Friends, Rivals (exhibition catalogue), Paul Klee Zentrum, Bern & Städtische Galerie im Lenbachhaus und Kunstbau, Munich, 2015-16, illustrated in a photograph of Kandinsky\’s Dessau apartment p. 284 'The circle is the synthesis of the greatest oppositions. It combines the concentric and the excentric in a single form, and in equilibrium... It points most clearly to the fourth dimension.' Wassily Kandinsky Vertiefte Regung (Deepened Impulse) is Kandinsky's resonant meditation on the essential beauty of circles.Painted in February 1928 whilehe taught at the Bauhaus design school in Dessau, the pictureembodies the aesthetic principlesthat Kandinskypromoted to his students.Circles dominated his most meaningful compositions of this intellectually sophisticated period of his career, and he expounded upon their incomparable aesthetic values in his writing. Inresponse towhy this form was so significant in hisart, he couldreadily enumeratethe reasons.The circle,he believed, was \‘1. the most modest form, but asserts itself unconditionally, 2.a precise but inexhaustiblevariable, 3.simultaneously stable and unstable. 4. simultaneously loud and soft, 5, a single tension that carries countless tensions within it.The circle is the synthesis of the greatest oppositions' (quoted in Jelena Hahl-Koch, Kandinsky, London, 1993, pp. 284 & 289). Vertiefte Regung carries on the artistic philosophies that the artist professed so passionately in his 1911 treatise Concerning the Spiritual in Art.Kandinsky was interested in Eastern mysticism and Theosophy, and his ideas about artand its resonant connection to the soul were integral to his practice. While his descriptivelanguage may sound ecstatic,his resulting canvases were no less visually spectacular:\‘Technically, every work of art comes into being in the same way as the cosmos - by means of catastrophes, which ultimately create out of the cacophony of the various instruments that symphony we call the music of the spheres. The creation of the work of art is the creation of the world.\’ At the heart of the present composition is agreat explosion into darkness,rendered with an abrupt transitionfrom the primarily white background into the effervescentblue and blacknessof the centre.It is as if the artist is attempting to 'annihilate' the background, ripping itopen torevealinfinity beyond the canvas and creating apictorial\‘black hole\’.The circles, which had become his favourite form during the Bauhaus years,appear to befloating in space, like stars eclipsing and colliding with one anotherin their perpetual motion through the cosmos. Both thepresent composition andEinige Kreise (Several Circles), in the collection of The Solomon R. Guggenheim Museum (fig. 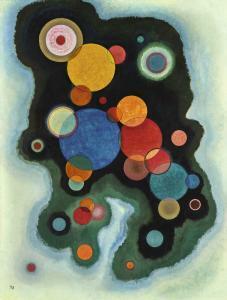 3),are clear manifestations ofKandinsky's documented fascination with astronomy.Writing about the Guggenheim picture, Jelena Hahl-Koch has pointed out: \‘There is a strong association with planets and stars in this and all the pictures of circles, especially those painted on dark backgrounds. The links between artistic creation and the "creation of the world," bound by the laws of nature, come easily to mind\’ (J. Hahl-Koch, op. cit., p. 284).Hahl-Koch recounts thatin the earlytwentieth century, Kandinsky and Gabriele Münterwould often invite anastronomerfriend to their home on clearnights to guide them through thestarry sky witha telescope.The artist's instruction in astronomy proved highly influential to his painting, particularly the compositions he created at the Bauhaus, where the harmony and interplay of circles was his favourite motif. Once the Weimar Bauhaus was closed by the National Socialists in April 1925, the school was moved to Dessau, where Walter Gropius designed a housing estate for the Bauhaus masters, with one of the houses shared by Kandinsky and Klee. Once he completed Vertiefte Regung in 1928, Kandinsky evidently deemed it an important work, as it hung in his exotically coloured living room with walls painted gold, pale pink and ivory, and ceiling painted grey (fig. 2). The first owner of this painting was Otto Ralfs (1892-1955), a businessman and art collector based in Braunschweig.Ralfs was instrumental in supporting the careers of several emerging artists at the time, including the Mexicanmuralist Diego Rivera,and founded theKandinsky Gesellschaft and Klee Gesellschaft in 1925.These organisations ensured that each artistreceived a monthly stipend from contributingprivate collectors in Germany and Switzerland.In exchange, the collectors were eligiblefor discounts on works of art and received a drawing or painting as aNew Year's gift.Like so many of his generation, Ralfs went bankrupt in the 1930s and sold his collection. Ralfs sold Vertiefte Regung to Salomón Hale, a private collector of Polish origin, based in Mexico City. The sale was organised with the assistance of Rivera, who had wanted to purchase the painting for himself but was unable to afford it. The collector and dealerGalka Scheyer was also Mexico in the autumn of 1931, and she probablyfacilitated the transaction for her friends Kandinsky and Ralfs.An early patron of modern Mexican art, Hale assembled a collection that included works by Rivera, Frida Kahlo and Rufino Tamayo, among others, as well as a number of work by European artists including Picasso, Miró and Kandinsky. He was an important patron of the Galería de Arte Mexicano, and purchased works both from the gallery and directly from friends.